The four principle collections hold both historical and current disease conditions spanning from the 1940’s to the present day. The specimens are anonymized but are accompanied by a brief description of the clinical presentation and/ or pathological findings. PLEASE NOTE: This is the most interesting and understandable collection. It is open for public viewing. Dr. William Boyd (1885- 1979) was a very famous professor of Pathology and author of numerous pathology textbooks. He was brought in to be the first Head of the Pathology Department at UBC when the medical school started in 1950. He brought with him a collection of specimens which formed the basis for this collection, some of which are still on display. 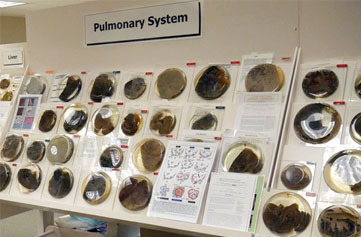 This collection formed the core of the pathological specimens used to teach the Medical Undergraduate students and residents and has been added to over the years. It was housed on the 3rd floor of the Jimmy Patterson Pavilion – North, for many years and was moved to the Diamond Health Care Centre when the building opened in 2006. 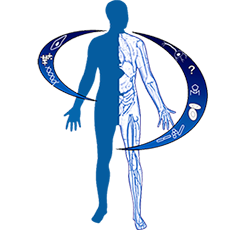 This collection has over 1500 specimens and is organized by organ system, with a letter to designate the organ and a 4 digit number, the first two of which indicate the disease category, based on a system with 10 categories of diseases. This collection is viewable by the public. Dr. Betty Poland (1919-1992) was a professor of Obstetrics and Gynecology and Medical Genetics who served as a mentor to many people studying Human Development at UBC. 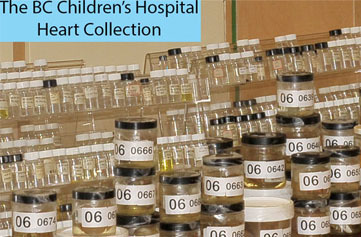 This collection was housed at BC Children’s Hospital and demonstrates a range of conditions that arise when organs don’t develop properly, from the tiniest embryos with chromosomal abnormalities to issues with intrauterine development to conditions which impact people later in life. This collection began at BC Children’s Hospital in the 1960s and is a specialized collection to demonstrate the ways that heart malformations affect the heart and methods of repairing these defects. It is used only for training medical students, residents and fellows. Dr. William Thurlbeck (1928-1997) was a professor of Pathology who studied lung diseases and developed a system for quantifying Emphysema. This is a research collection that includes an x-ray, a section of lung on paper (Gough sections), microscope slides, 35mm slides and other material.